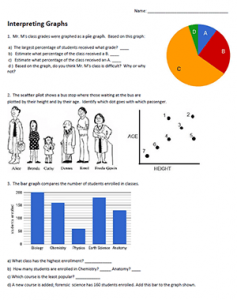 Students practice analyzing pie charts, scatter plots, and bar graphs in the basic worksheet that is designed to pair with lessons on the scientific method. Most beginning biology students (in high school) are fairly adept at interpreting basic information from graphs, though scatter plots are sometimes challenging for them. I usually do this type of exercise during the first unit where the scientific method is discussed. Students eventually learn how to create their own graphs and determining which variables go on the x axis (independent) and which go on the y axis (dependent) and how to use one graph to represent multiple data sets. I usually don’t spend a lot of time here, and use the worksheet as either a warm-up or an end of class reinforcement exercise.